I rarely – OK, never – feature writing that is not at least partly my own, but this is special. 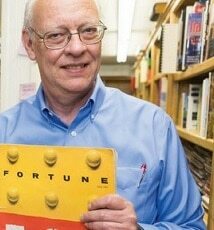 My lifelong friend Gary Hoover, who founded Bookstop (the firm that was the foundation for Barnes and Noble Superstores) and who writes about learning, self-education, and business history, is interviewed in a podcast here (https://www.rogerdooley.com/gary-hoover-books) by Roger Dooley, an author and Forbes columnist. Gary’s latest book, The Lifetime Learner’s Guide to Reading and Learning, is available at the link. Gary has 57,000 books at “home” (more like a warehouse), including airline schedules from a century ago and the original books describing the 1909 Plan of Chicago, the 1893 Chicago World’s Fair, and the 1922 Chicago Tribune Tower Competition. He is also a “threatened” co-author of mine: he and I, with a third author, have discussed updating his classic The Art of Enterprise. Someday we will do it. For now, I hope you enjoy the podcast. Click on link to view or download. All rights reserved. Downloads are for the personal use of the visitor only. Please E-mail me if you want permission to circulate. I don’t own redistribution rights to all materials linked here, so you may have to wait for me to ask a publisher or co-author. CFA Institute Research Foundation downloads may be saved, copied, and circulated. “Clay Christensen: Disruption and Innovation Can Solve Global Poverty,” AJO, April 2019. “How Paul Volcker Saved Our Country,” AJO, February 2019. “Combining Conventional Investing with a Lifetime Income Guarantee: A Blueprint for Retirement Security,” with Thomas L. Totten, AJO, December 2018. “Building Portfolios for Households with Multiple Investment Goals,” with Andrew Rudd, AJO and Advisor Software, Inc., December 2018. “On Pigs, Cobwebs and Howard Marks,” AJO, November 13, 2018. “Conference Roundup: Cullen Roche on Why We’re All Active Investors,” AJO, October 2018. “Michael Lewis on the Hidden Benefits of Competent Government,” AJO, October 15, 2018. “Conference Roundup: Sam Huntington’s Clash of Civilizations 20 Years Later,” AJO, September 2018. “Introduction to: The Prosperity Puzzle: Restoring Economic Dynamism,” edited by David E. Adler and Laurence B. Siegel, Forthcoming from the CFA Institute Research Foundation, AJO, Late 2018. “Don’t Be Fooled by the Yield Curve,” AJO, August 21, 2018. “Foreword to: Popularity: A Bridge Between Classical and Behavioral Finance,” A CFA Institute Research Monograph forthcoming in Fall 2018, AJO, July 2018. “Byron Wien on Trump, Trade, Deficits and Thucydides,” AJO, July 10, 2018. “Conference Roundup: Bubbles for Fama,” AJO, May 2018. “Is Life Improving? Documenting the Remarkable Progress of Humankind,” AJO, May 1, 2018. “Conference Roundup: The Annotated Russell Napier,” AJO, April 2018. “She Caught the CATY, and Left Me a Mule to Ride: Improving on Dividend Yield as an Indicator of Stock Valuations and Expected Returns,” AJO, March 2018. “What Investment Risk Really Is, Illustrated,” with M. Barton Waring, AJO, January 24, 2018. “The Unicycling Genius Who Invented Information Theory: A Review of a Mind at Play, by Jimmy Soni and Rob Goodman,” AJO, November 28, 2017. “The Rules of Growth: Organisms, Cities and Companies,” AJO, October 2017. “‘They Can Make Everything for Less’: Woody Brock on Why Productivity is Mismeasured and Understated,” AJO, September 2017. “The Equity Risk Premium: A Contextual Literature Review,” AJO, September 2017. “Index Fund Silliness: Indexing Doesn’t Distort Anything,” AJO, August 2017. “It Takes a Theory to Beat a Theory, or the Trouble with Tribbles,” AJO, June 2017. “The Age of Experts: A Review of Marc Levinson’s An Extraordinary Time,” with Stephen C. Sexauer, AJO, June 2017. “Value Investing: Robots versus People,” AJO, May 2017. “Disruption – Conference Roundup,” AJO, May 2017. “A Nation of Slugs?,” AJO, April 2017. “To Hell in a Handbasket? No Way, Says Johan Norberg,” AJO, March 21, 2017. “The Bromance that Turned Economics Upside Down,” AJO, February 7, 2017. “How Should History Judge Alan Greenspan?,” AJO, December 6, 2016. “The Only Saving Rate Article You Will Ever Need,” with M. Barton Waring, AJO, November 2016. “Floods and Deserts: Why the Dream of a Secure Pension for Everyone is Still Unattained,” with Stephen C. Sexauer, AJO, November 2016. “Is It Science or Is It Baloney?,” AJO, September 2016. “CAPMing the CAPE: Shiller-Siegel Shootout at the Q Group Corral, Part 2,” AJO, August 2016. “Milton Friedman and Monetarism Through the Looking Glass,” with Paul D. Kaplan, AJO, August 2016. “McKinsey Assesses Future Stock and Bond Returns: Are the good times really over for good?,” AJO, May 2016. “Debunking Nine Myths of Investing,” AJO, April 2016. “Five Mysteries Surrounding Low and Negative Interest Rates,” with Stephen C. Sexauer, AJO, Spring 2016. “Robert Gordon, the Special Century, and the Prospects for Economic Growth,” AJO, December 22, 2015. “Phooey on Financial Repression,” with Thomas S. Coleman, AJO, September 2015. “There Was Nothing I Could Do – All The Correlations Had Suddenly Gone To One!,” with M. Barton Waring, AJO, September 2015. “The Pension Crisis: Six Lessons Learned and a Way Forward,” with Stephen C. Sexauer, The Retirement Management Journal, Fall 2015. “How Emerging is Your Emerging Markets Manager? Arguing for a Bigger Allocation to Small Caps,” with Michael Reynal, July, 2015. “The Inventor of Behavioral Finance Looks Back,” June 23, 2015. “Can We Recover From the Public Debt Crisis? Of Course We Can,” June 9, 2015. “The Final Say on Spending Rules,” March 31, 2015. “Alternative Investments in DC Retirement Plans: Opportunities and Concerns”, Sexauer, Stephen C., and Laurence B. Siegel, June 2014. “The only spending rule article you’ll ever need,” with M. Barton Waring. Submitted to the Financial Analysts Journal, 2014. “Read Your Sharpe and Markowitz,” July 2014. “One Future, Two Views of Growth,” July 15, 2014. “Tempest in a Teapot: Michael Lewis’ Flash Boys Solve a Problem that is Barely There,” April 29, 2014. “How to Confront the End of the Bond Bull Market,” (Review of Simon Lack’s Bonds are Not Forever), March 25, 2014. “CAPE Crusaders: The Shiller-Siegel Shootout at the Q Group Corral,” February 2014. “Morningstar Conversation With Laurence Siegel & Michael Falk”, by Paul D. Kaplan, January 22, 2014. “The Age of Experts: A Review of Marc Levinson’s An Extraordinary Time,” with Stephen C. Sexauer, Business Economics, October 26, 2017. A departure from the CFA Institute Research Foundation’s traditional area of focus, this Research Monograph advocates greater self-reliance, social safety nets that act more like trampolines, and a better, more fiscally responsible society. My Foreword places the book in context and showers it with the usual praise found in forewords. Or – much better idea – read the whole book! The CFA Institute Research Foundation, March 2016. “The Equity Risk Premium: A Contextual Literature Review,” by Laurence Siegel, November 2017. “Five Mysteries Surrounding Low and Negative Interest Rates,” with Stephen C. Sexauer, The Journal of Portfolio Management, Spring 2017. “The Only Saving Rate Article You Will Ever Need — Using Just a Handheld Financial Calculator!,” with M. Barton Waring, The Journal of Investing, Spring 2017. “Busted! Nine Hoary Myths of Investing; Be Not Afraid,” Welling on Wall St., April 15, 2016. “Pension Promises, Promises,” Welling on Wall St., June 26, 2015. “Growth: Slow In The Short Run, But…,” Welling on Wall St., September 26, 2014. “Clay Christensen: Disruption and Innovation Can Solve Global Poverty,” Advisor Perspectives, April 8, 2019. “How Paul Volcker Saved Our Country,” Advisor Perspectives, February 4, 2019. “Tributes to Jack Bogle (1929-2019),” with Ted Aronson and Robert Huebscher, Advisor Perspectives, January 30, 2019. “On Pig Farming, Cobwebs and Howard Marks,” Advisor Perspectives, November 12, 2018. “Michael Lewis’ Frightening Account of Government in the Age of Trump,” Advisor Perspectives, October 15, 2018. “Don’t Be Fooled by the Yield Curve,” Advisor Perspectives, August 20, 2018. “Byron Wien on Trump, Trade, Deficits and Thucydides,” Advisor Perspectives, July 9, 2018. “The People versus Themselves: Two Views on Populism,” Advisor Perspectives, June 4, 2018. “Why Nassim Taleb Thinks Leaders Make Poor Decisions,” Advisor Perspectives, April 2, 2018. “‘Uneasy lies the head that wears a crown’: A Conversation with Jack Bogle,” Advisor Perspectives, January 22, 2018. “The Unicycling Genius Who Invented Information Theory,” Advisor Perspectives, November 27, 2017. “Woody Brock: Global Growth is Mismeasured and Understated,” Advisor Perspectives, September 11, 2017. “Fire Marshal in a Nightclub: Richard Bookstaber Explains Financial Risk Management,” Advisor Perspectives, August 7, 2017. “What We Can Learn from Andrew Lo’s Adaptive Markets,” Advisor Perspectives, June 26, 2017. “Value Investing: Robots versus People,” Advisor Perspectives, June 4, 2017. “Tyler Cowen and the Fallacy of American Laziness,” Advisor Perspectives, May 1, 2017. “Middle-Class Wage Stagnation Is a First-World Problem – The World is Getting Richer,” Advisor Perspectives, March 20, 2017. “The Bromance that Turned Economics Upside Down,” Advisor Perspectives, February 6, 2017. “A Prediction for the Future of Active Management,” Advisor Perspectives, January 2, 2017. “How Should History Judge Alan Greenspan?,” Advisor Perspectives, December 5, 2016. “McKinsey Assesses Future Stock and Bond Returns: Are the good times really over for good?,” Advisor Perspectives, May 31, 2016. “A Conversation with Mohamed A. El-Erian,” Advisor Perspectives, February 22, 2016. “What Would Minsky Do Now?” Advisor Perspectives, February 1, 2016. “Robert Gordon, the Special Century, and the Prospects for Economic Growth,” Advisor Perspectives, December 22, 2015. “The Hidden Cost of Zero Interest Rate Policies,” with Thomas S. Coleman, Advisor Perspectives, September 28, 2015. “Why Byron Wien is an Optimist,” Advisor Perspectives, June 7, 2016. “The Tooth-Fairy Economics of Jeff Madrick,” December 2, 2014. “Tempest in a Teapot: Michael Lewis’ Flash Boys Solves a Problem That is Barely There,” April 29, 2014. “CAPE crusaders: The Shiller-Siegel Shootout at the Q Group Corral,” February 18, 2014. “Defined Contribution Retirement Plans Should Look and Feel More Like Defined Benefit Plans,” with Antti Ilmanen, David G. Kabiller, and Rodney N. Sullivan, AQR, The Journal of Portfolio Management, Winter 2017. “What Investment Risk Means to You, Illustrated: Strategic Asset Allocation, the Budget Constraint, and the Volatility of Spending During Retirement,” with M. Barton Waring, Journal of Retirement, Fall 2018. “Floods and Deserts: Why the Dream of a Secure Pension for Everyone Is Still Unattained”, with Stephen C. Sexauer, Journal of Retirement, Spring 2017. “The Investor’s Dilemma in Year Seven of Financial Repression”, May 2014. “On The Bright Side: An Interview With Stephen C. Sexauer”, January 2014.